Not to be confused with Celestia. The celesta /sᵻˈlɛstə/ or celeste /sᵻˈlɛst/ is a struck idiophone operated by a keyboard. 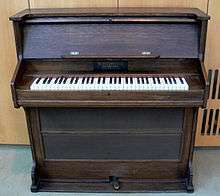 It looks similar to an upright piano (four- or five-octave), or a large wooden music box (three-octave). The keys connect to hammers that strike a graduated set of metal (usually steel) plates suspended over wooden resonators. Four- or five-octave models usually have a pedal that sustains or damps the sound. The three-octave instruments do not have a pedal because of their small "table-top" design. One of the best-known works that uses the celesta is Tchaikovsky's "Dance of the Sugar Plum Fairy" from The Nutcracker. The sound of the celesta is similar to that of the glockenspiel, but with a much softer and more subtle timbre. This quality gave the instrument its name, celeste meaning "heavenly" in French. The celesta is a transposing instrument; it sounds one octave higher than the written pitch. Its (four-octave) sounding range is generally considered as C4 to C8, where C4 = middle C. The original French instrument had a five-octave range, but because the lowest octave was considered somewhat unsatisfactory, it was omitted from later models. The standard French four-octave instrument is now gradually being replaced in symphony orchestras by a larger, five-octave German model. Although it is a member of the percussion family, in orchestral terms it is more properly considered as a member of the keyboard section and usually played by a keyboardist. The celesta part is normally written on two bracketed staves, called a grand staff. The celesta was invented in 1886 by Parisian harmonium builder Auguste Mustel. His father, Victor Mustel, had developed the forerunner of the celesta, the typophone, in 1860. This instrument produced sound by striking tuning forks instead of the metal plates that would be used in the celesta. The dulcitone functioned identically to the typophone and was developed concurrently in Scotland; it is unclear whether their creators were aware of one another's instrument. The typophone/dulcitone's uses were limited by its low volume, too quiet to be heard in a full orchestra. Pyotr Tchaikovsky is usually cited as the first major composer to use this instrument in a work for full symphony orchestra. He first used it in his symphonic poem The Voyevoda, Op. posth. 78, premiered in November 1891. The following year, he used the celesta in passages in his ballet The Nutcracker (Op. 71, 1892), most notably in the Dance of the Sugar Plum Fairy, which also appears in the derived Nutcracker Suite, Op. 71a. However, Ernest Chausson preceded Tchaikovsky by employing the celesta in December 1888 in his incidental music, written for a small orchestra, for La tempête (a French translation by Maurice Bouchor of Shakespeare's The Tempest). The celesta is also notably used in Gustav Mahler's Symphony No. 6, particularly in the 1st, 2nd and 4th movements, in his Symphony No.8 and Das Lied von der Erde. Karol Szymanowski featured it in his Symphony No. 3. Gustav Holst employed the instrument in his 1918 orchestral work The Planets, particularly in the final movement, Neptune, the Mystic. It also features prominently in Béla Bartók's 1936 Music for Strings, Percussion and Celesta. George Gershwin included a celesta solo in the score to An American in Paris. Ferde Grofe also wrote an extended cadenza for the instrument in the third movement of his Grand Canyon Suite. Dmitri Shostakovich included parts for celesta in seven out of his fifteen symphonies, with a notable use in the fourth symphony's coda. 20th Century American composer Morton Feldman used the celesta in many of his large-scale chamber pieces such as Crippled Symmetry and For Philip Guston, and it figured in much of his orchestral music and other pieces as well. In some works, such as "Five Pianos" one of the players doubles on celesta. The celesta is used in many 20th century opera scores, including Puccini's Tosca (1900), Ravel's L'heure espagnole (1911), Strauss's Ariadne auf Naxos (1912), and Die Frau ohne Schatten (1918), while "an excellent example of its beauty when well employed", is the Silver Rose scene in his Der Rosenkavalier (1911), Busoni's Arlecchino (1917) and Doktor Faust (1925),, Orff's Carmina Burana (1936) and Der Mond (1939), Menotti's Amelia Goes to the Ball (1937), Britten's The Turn of the Screw (1954) and A Midsummer Night's Dream (1960), Susa's Transformations (1973), and Philip Glass' Akhnaten (1984). Since Earl Hines took it up in 1928, other jazz pianists have occasionally used the celesta as an alternative instrument. In the 1930s, Fats Waller sometimes played celesta with his right hand and piano simultaneously with his left hand. Other notable jazz pianists who occasionally played the celesta include Meade "Lux" Lewis, Willie "The Lion" Smith, Art Tatum, Duke Ellington, Thelonious Monk, Buddy Greco, Oscar Peterson, McCoy Tyner, Sun Ra, Keith Jarrett, and Herbie Hancock. A celesta provides the introduction to Someday You'll Be Sorry, a song Louis Armstrong recorded for RCA, and is featured prominently throughout the piece. A number of recordings Frank Sinatra made for Columbia in the 1940s feature the instrument (namely I'll Never Smile Again), as do many of his albums recorded for Capitol in the 1950s (In the Wee Small Hours, Close to You and Songs for Swingin' Lovers). The instrument is used prominently in the introduction to the 1928 recording by Louis Armstrong and His Hot Five of "Basin Street Blues". The celesta has been common in cinema for decades. In addition to supplementing numerous soundtrack orchestrations for films of the 1930s, 1940s and 1950s, the celesta has occasionally been spotlighted to invoke a whimsical air. Celesta provides the signature opening of Pure Imagination, a song (sung by Gene Wilder) from the 1971 film Willy Wonka & the Chocolate Factory. Composer John Williams's scores for the first three Harry Potter films feature the instrument, particularly in the first two films' frequent statements of "Hedwig's Theme". Another notable use of the celesta was in some of the music on children's television series Mister Rogers' Neighborhood. It was most famously heard in the intro to the theme song of the program, "Won't You Be My Neighbor", which began with a dreamy sequence on the instrument. The song was sung by Fred Rogers and played by Johnny Costa. It was also used from time to time in other music sequences throughout the program, such as the one heard as the Neighborhood Trolley moved in and out of the Neighborhood of Make Believe. ↑ Mo, Sue. "Dulcitone". Sumo55 Websites & Multi Media Design. Retrieved 28 September 2016. ↑ Freed, Richard. [LP Jacket notes.] "Tchaikovsky: 'Fatum,' ... 'The Storm,' ... 'The Voyevoda.'" Bochum Orchestra. Othmar Maga, conductor. Vox Stereo STPL 513.460. New York: Vox Productions, Inc., 1975. ↑ Luttrell, Guy L. (1979). The Instruments of Music, p.165. Taylor & Francis. ↑ "All Or Nothing At All: A Life of Frank Sinatra", DonaldClarkeMusicBox.com. ↑ "500 Greatest Albums of All Time, 100/500: In the Wee Small Hours – Frank Sinatra", RollingStone.com. ↑ "Everyday by Buddy Holly", SongFacts.com. ↑ "'Baby It's You' History", BeatlesBooks.com. ↑ "Lou Reed—Sunday Morning", CreemMagazine.com. ↑ (August 27, 2010). "Iggy Pop keeps Stooges raw, real", ChicagoTribune.com. ↑ "Schiedmayer Celesta". Schiedmayer GmbH. Retrieved 2016-01-03. Schiedmayer's website claims that it "...is today the only Celesta manufacturer worldwide." However, this claim is contradicted by Yamaha. ↑ "An Overview of Yamaha Celestas". Yamaha Corporation. Retrieved 2016-01-03. Yamaha's website states that it has manufactured Celestas since 1992. Wikimedia Commons has media related to Celesta.